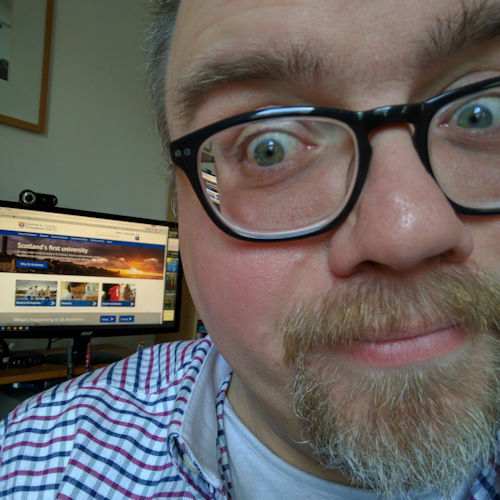 The year was 2005, I was working in a ministry team in Edinburgh across two parishes and a hospital chaplaincy; I had diocesan and provincial (for the whole of Scotland) responsibilities on their respective information and communication committees; and I felt overwhelmed. I had used a Psion since 1996, first the Siena, then 3mx and 5mx. I synchronised them with my Windows PCs which allowed me to carry my calendar, contacts and to-do lists around with me. But I still felt overwhelmed. In my home office I had six in-trays and a filing cabinet that was in disarray. I needed help. That help came via the aptly titled Take Back Your Life! : Using Microsoft Office Outlook to Get Organized and Stay Organized by Sally McGhee (Microsoft Press, 2017). Based on similar principles to David Allen’s Getting Things Done (GTD) approach, McGhee’s processes helped me understand what I needed to do to prioritise and organise my life better. Nearly 14 years later and I am still using many of the principles I learned in McGhee’s book. That moment of crisis in turn led me to explore project management and Agile, and here I am employed as a Scrum Master in a software development company putting many of these principles to work every day. I also use Dropbox for storing documents and supporting files, and GitHub for version control of any code projects. Microsoft OneNote was the last application that I adopted but when I did, finally everything fell into place. When coupled with the 12 Week Year approach, I’ve found myself achieving more in three months than the previous three years. Something I love about this system is that I can use these applications wherever I need: on my desktop, my laptop, on a tablet, smartphone or via a browser. I now plan everything in Microsoft OneNote, 12 weeks at a time. Every Sunday evening I schedule a weekly review that lasts anywhere from one to two hours. Live a slower, more balanced life. I want to continue to develop a healthy and balanced rule of life. I have a lot to juggle: daily life, spiritual life, family life, relationships with friends and family, and work. During the last ten years or more, I have not kept a good balance and have regularly burned out physically and emotionally, or have come down with a particularly bad illness. This must change if I am to regain my health, and be a good role model for my children, as well as be able to support them physically, emotionally and financially to the best of my ability. I can’t do this all at once. So I must work on this in small, manageable increments. This page reminds me what I think is important and why I am trying to life a more simple and disciplined life. It also helps when I need to prioritise tasks and projects: does this task help support my goals? 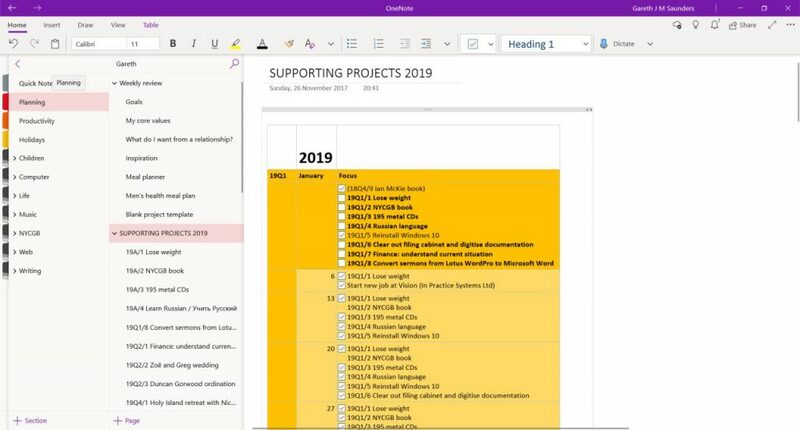 Within my Planning section in OneNote, I have a page that outlines in a table the projects I want to complete during the current 12-week block. I then create a new page for each project that I want to work on. I have a code for these pages, e.g. 19Q1/4. This tells me that I started this project in 2019 Q1 (January to March) and was project number (and priority) four. It helps me track, at a glance, how long the projects have taken me. I recently introduced a new code, e.g. 19A/1 (A for annual, i.e. a project that I expect to be working on all year). This helps me distinguish the shorter, more time-specific projects. Within the project pages, I detail the goal in full: what do I want to do and why. I then list the objectives, quality standards, acceptance criteria and metrics (how will I know when that project is complete?). These help to keep me focused on what I want to achieve and help me each Sunday during my weekly review to decide what to work on next to move the project to completion. Having reviewed my goals and project plan. I set out planning my week in Google Calendar. For the larger projects, I try to block out at least two to three hours so that I can get into a ‘deep work’ state and really make some progress. 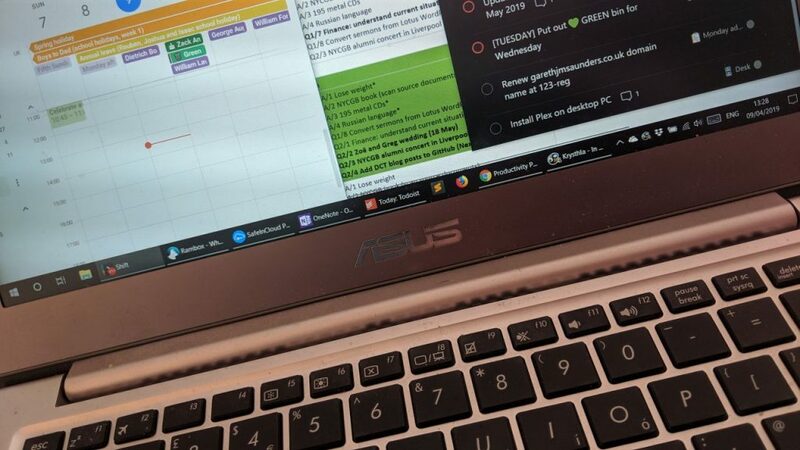 Some projects are small and simple, just a handful of sub-tasks that can be planned out in OneNote. Other projects are more complicated and require a dedicated tool. For those projects I use Trello. I find Trello to be fabulous for managing projects. It is visual. You can capture descriptions, checklists, comments, images and documents. It is highly customisable and on the paid-for accounts you have access to various plugins that can add calendars, GitHub integration, etc. I also use Zapier on one Gmail account to create a new card in Trello whenever I move an email into a subfolder. Each project is different, but I tend to use the same columns for each: Backlog, In Progress, Waiting for, Done. As you can see, I group together my shopping lists at the top of the list. This just make them quicker to access on my phone in the supermarket. Then I have tasks grouped into contexts in a GTD-style. Depending on what is going on, these contexts change over time. I will sometimes have a “Phone” or “Email” section if I’m doing a lot of correspondence. A lot of stuff goes into “Desk” and I’ve recently been experimenting with a “Monday admin” category which allows me to postpone certain tasks until my scheduled life-admin appointment with myself on a Monday evening. 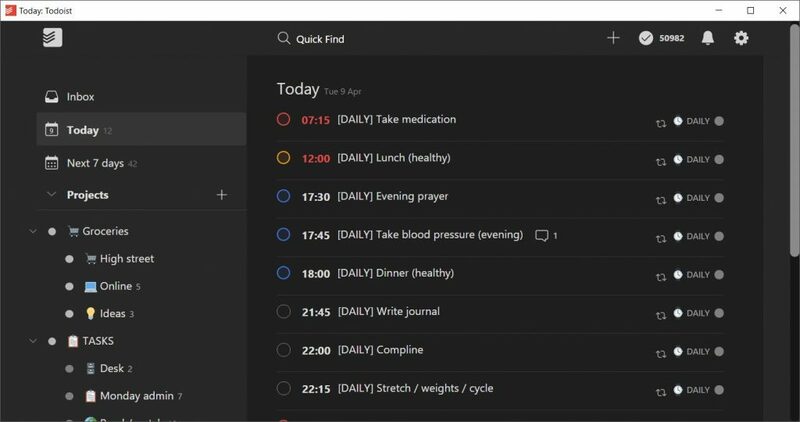 The 1:1 sections allow me to capture things I want to tell people, and the “Calendar” section allows me to capture my daily, weekly and annual routines as well as tasks I need to remember in the future (similar to David Allen’s ‘tickler’ files). I like to have these pop up on my task list every day to remind me of my routines as well as regular payments going out my accounts (bills and subscriptions). “Someday maybe” captures project ideas that I may get to one day, and the “Waiting for…” sections help me remember items that I’ve loaned to or borrowed from friends and colleagues. This is a very brief overview of my current organisation and planning system, I may go into more detail in future posts, but it works very well for me. For a long time I tried to limit myself to using only one task management application. I would periodically switch between Trello and something else (Outlook tasks, Wunderlist, Todoist, etc.) Eventually, I realised that I could use both: Trello for the bigger projects, Todoist for the small. Regardless of the tools used (I could easily do all of this in a notebook and physical diary), the most important element, I’ve discovered over the years, is the weekly review. That opportunity to stop and review where I am, re-prioritise and make adjustments to keep me on track.